The Goodyear name is more familiar in motor racing than within cycling, but the brand synonymous with the eponymous blimp has recently released a range of mountain bike tyres. We’ve been running their gravity-oriented offering, appropriately named Newton and Newton ST. These come in 2.4 and 2.6 widths in both 27.5 and 29er wheel sizes. 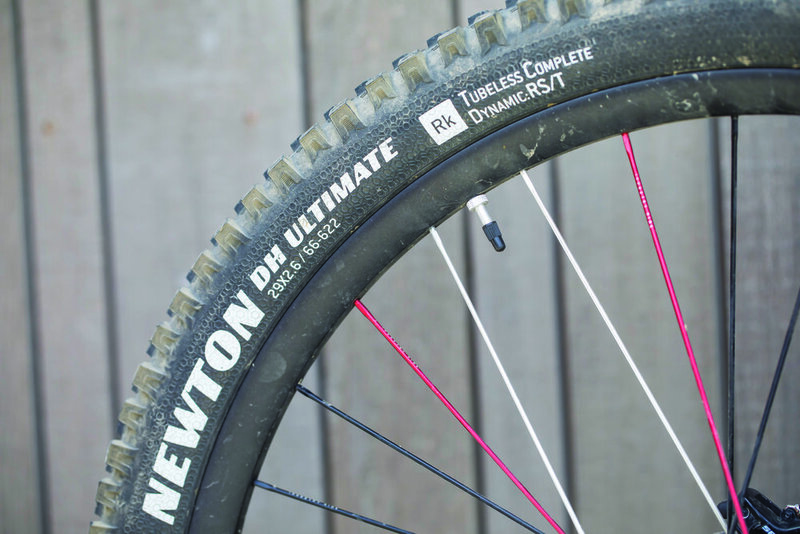 Our test tyres are the 2.6 DH Ultimate / Dynamic: RS/T / A:Wall 29er version. These feature the softest compound rubber and their DH casing uses dual ply casing and features Goodyear’s A:Wall, a butyl layer under the casing ply for additional sidewall protection. There are also two lighter casings for those requiring a regular trail-type tyre. A dual ply 2.6 DH tyre in 29er format isn’t going to set weight-weenies’ hearts ablaze. Goodyear claims a weight of 1367 grams for both tyres, but we weighed the ST version in at 1308 grams and the standard Newton at 1449 grams. So they’re big and burly. The casing is so robust the tyre practically stands up on its own, but we fitted them to a 30.9mm inside width rim without too much difficulty. They seated first time using a tubeless tyre setter and a little sealant, and have stayed firmly in place ever since. The Newton is a classic “paddle” style tyre, with large ‘L’ shaped blocks at the edge. It’s not unlike a Minion DHR and we ran this at the rear. The Newton ST has a more open tread, similar to Schwalbe’s Magic Mary which we deployed up front. On the 30.9 rim the tyre came up reasonably square and measured in at 2.48” for the Newton ST and 2.45” for the Newton. In softer dirt, the Newton inspired huge confidence, the 2.6 width and burly casing taking on rocks and off-camber roots with aplomb and cornering predictably. We dropped the pressure a little below Goodyear’s recommended levels. At 18–20 psi we had no issues with pinching or burping throughout the test period. In wet conditions they weren’t quite so sure-footed, but the footprint of this type of tyre will never cut through as well as a narrower option might. Hard-riding, tyre-ripping gravity fiends need look no further than here for an alternative to their favourite “M” or “S” brand tyre. Those who don’t need quite such a heavy duty casing should probably opt for the EN Ultimate version and drop a few grams in the process.